Fill a medium bowl with ice water. Using a sharp vegetable peeler, peel half of the asparagus lengthwise into ribbons. Transfer to the ice bath to chill until the asparagus curls, about 1 hour. Drain and gently pat dry. Meanwhile, fill a large bowl with ice water. In a medium saucepan of salted boiling water, blanch the remaining asparagus with the peas and edamame for 3 minutes; transfer to the ice bath to cool, then drain and pat dry. In a large bowl, whisk the mayonnaise with the lemon zest, lemon juice, thyme and garlic and season with salt and pepper. Add the asparagus ribbons, blanched vegetables and pea shoots, season with salt and pepper and gently toss to combine. Mound the salad on plates, sprinkle with feta and serve. 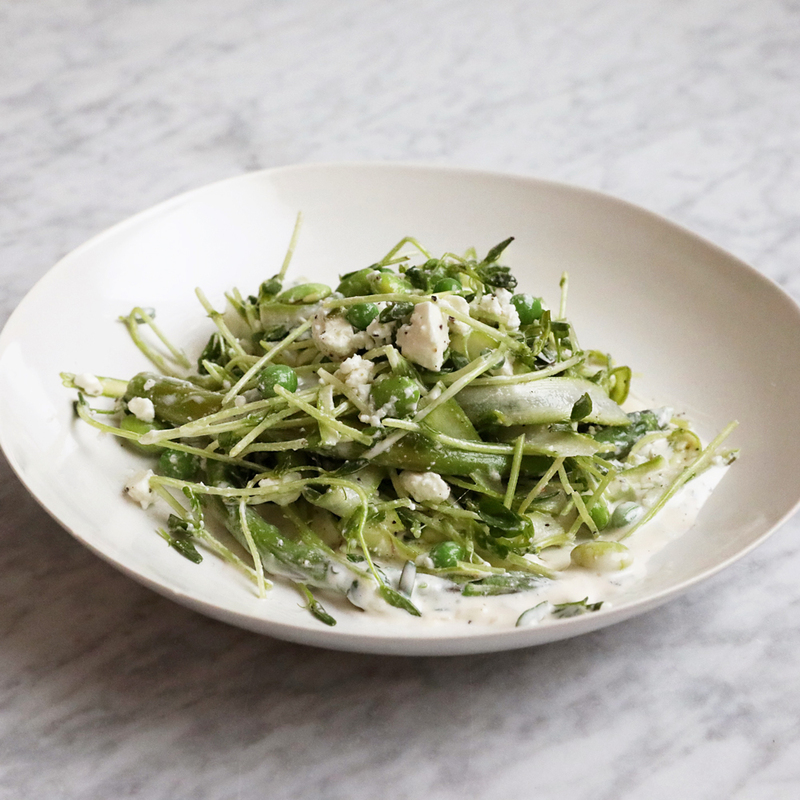 Review Body: Asparagus + Feta = Heaven. Review Body: No brainer, easy, tasty, light... what are you waiting for? Review Body: This dish looks fresh!